After spotting Adz and his Golf around town and at a couple of the local Collide meets I finally got chance to meet him and set up a shoot. His bright blue wheels stood out from a mile off and are bound to get him noticed wherever he goes, so it made sense to focus on this in the photos. Adam picked me up and after a rundown of the nights shoot, we arrived in a quiet carpark in town. The place was empty and lit by various street lights, as he gave the car a quick clean I got my gear set up. I got my first few frames using the 85mm f1.8 on my 550D. I chose this body purely because of the ISO range over the 5D mk1 and how it handles the much darker situations. I shot using one speed light through my Westcott Apollo and moved it about to spread the light evenly. This made the process a little longer but I still achieved a smooth, sharp shot in the end. I had a good wander around and moved closer to the car, this time shooting from the front but catching the wheels at such an angle that you can't help but notice their striking colour. These were a defining feature of the car, although plans are in the pipeline to get them changed pretty soon. In the same location we found an old metal gate which we figured might look pretty cool as a background. We backed up the Golf and set up the lights and went for a mean looking dead on angle. This one one of the more "posed" shots of the night, everything else was pretty casual. After a few close ups alternate angles we were done, we ended up with 5 solid shots and a few extras too. As well as an opportunity to meet Adz see his car properly this was a great chance for me to get back into using strobes, something I'm not overly experienced with using but I'm pleased with the results. 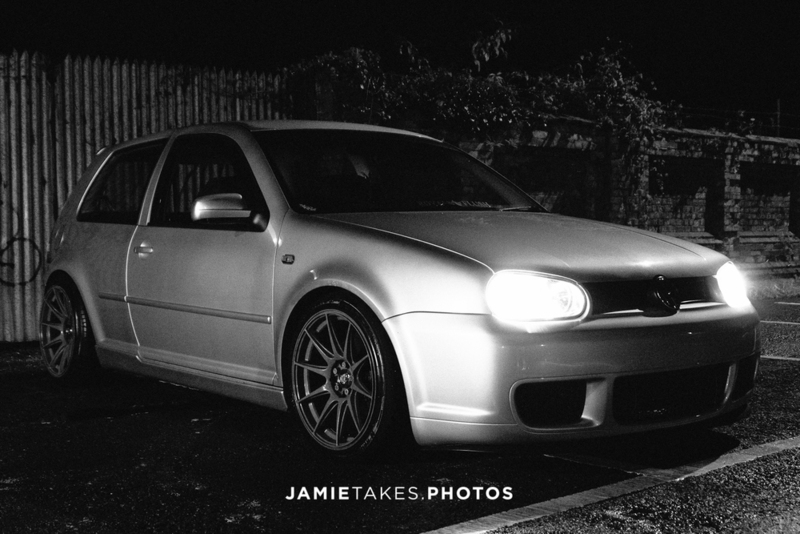 Check out the rest of my images below and if you're after a shoot with your car be sure to get in touch through my contact page or email hi@jamietakes.photos.